I have always loved The Doves Nest’s Chicken Pot Pie from the first time I tasted it. 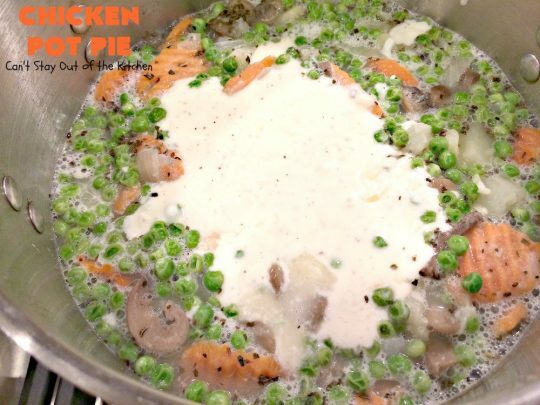 This is a delicious chicken pie filled with carrots, peas, onions, garlic, mushrooms, and made with whipping cream, basil, bay leaves, and chicken stock. The recipe actually calls for sherry but I’ve always omitted this. All I can say is this is one tasty Chicken Pot Pie. 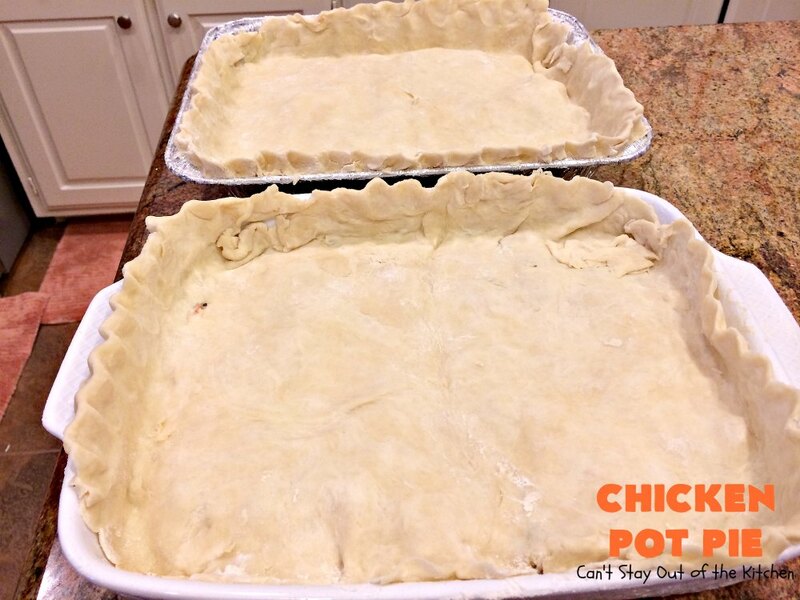 I make up my own double crust recipe for pie and since this makes two 9×13″ baking dishes it’s quite a lot of Chicken Pot Pie! You can easily freeze one of the pot pies and pull it out for later, or give it to someone in need of a meal (which is what I did). South of the Dallas Metroplex is a tiny Gingerbread House town that has a wonderful Tea Room called, “The Dove’s Nest.” It’s a great place to eat lunch with lots of salads, soups and entrees that are quite delectable. The restaurant also has a small gift shop associated with it that sells antiques and lots of crafty-type things. They are renowned in this area for their excellent food. The Dove’s Nest also has a great cookbook featuring many of their fabulous recipes. Years ago, our pastor’s wife at Hillcrest Baptist Church told me about their great cookbook and pointed me to several different recipes that she made all the time that were quite good. After looking through her copy of The Dove’s Nest Cookbook, I decided to get a copy of my own! One of those recipes Bev guided me to was “The Dove’s Nest Flower Pot Chicken Pie.” Flower Pots?? 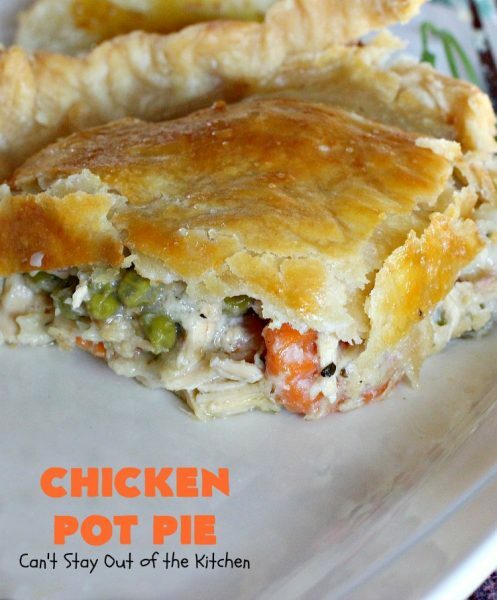 Yes, at the restaurant they actually serve this delicious Chicken Pot Pie in small flower pots! 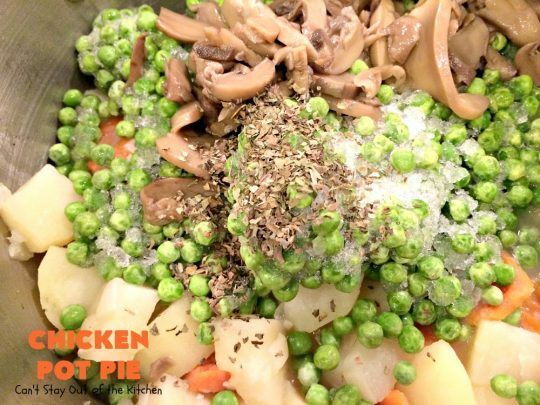 I will make only one recommendation for this delicious Chicken Pot Pie: taste the seasonings before you put the filling into the casserole dish and top it with pie crust. I’ve left the seasonings as is, but I would prefer them doubled because I like a lot of salt and pepper in this casserole. After tasting you may find the seasonings okay, or you may want to increase each of them, too. If you’re looking for a fabulous Chicken Pot Pie recipe this is it. It is however, a lot of work, and cannot be done in a jiffy. Rolling out pie crust takes time, plus I cooked off a chicken in my crockpot for this recipe, which meant doing that overnight and deboning the next morning. This recipe is best made when you have plenty of time. If you need tips for deboning chicken, check this post here. If you’re used to making your own pie crusts the basic recipe (once the chicken is deboned) doesn’t take too long to make up. 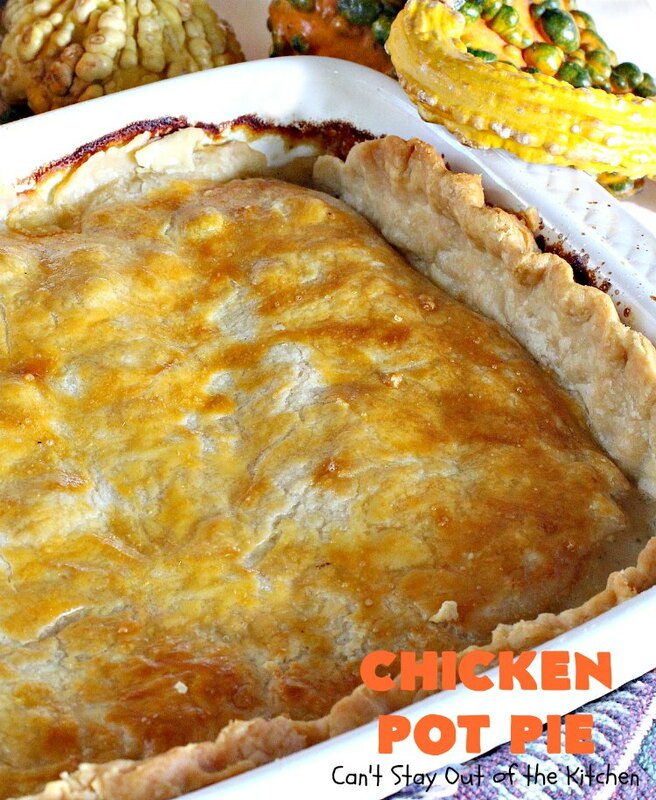 I used my Homemade Pie Crust recipe when I made this Chicken Pot Pie. However, if you’d like to try out this recipe but are short on time, here are my time-saving shortcuts. 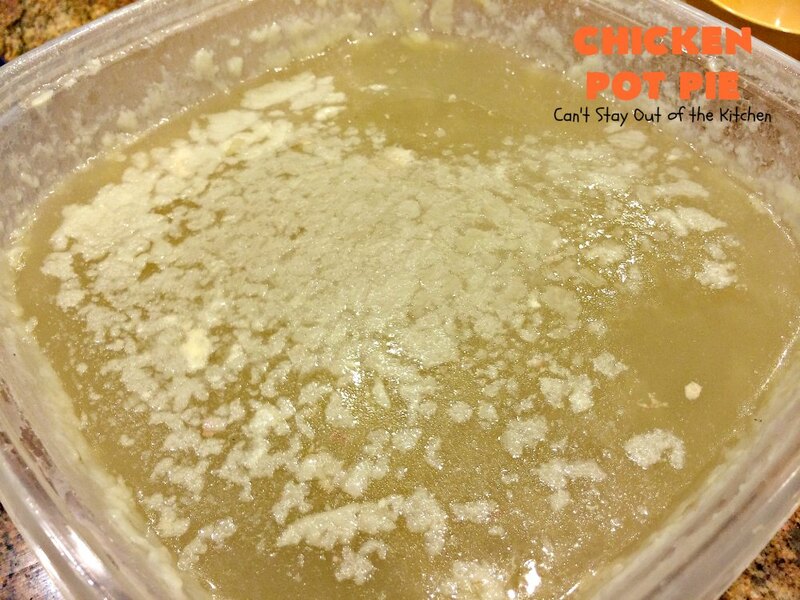 Use canned chicken broth and chicken. Purchase store bought pie crusts that all you have to do is place it on top of the casserole dish. That will cut down your preparation time tremendously. It may not be quite as good as homemade, but it comes pretty close. 🙂 Also, remember that you can cut this recipe down in half and only make one casserole if you prefer. 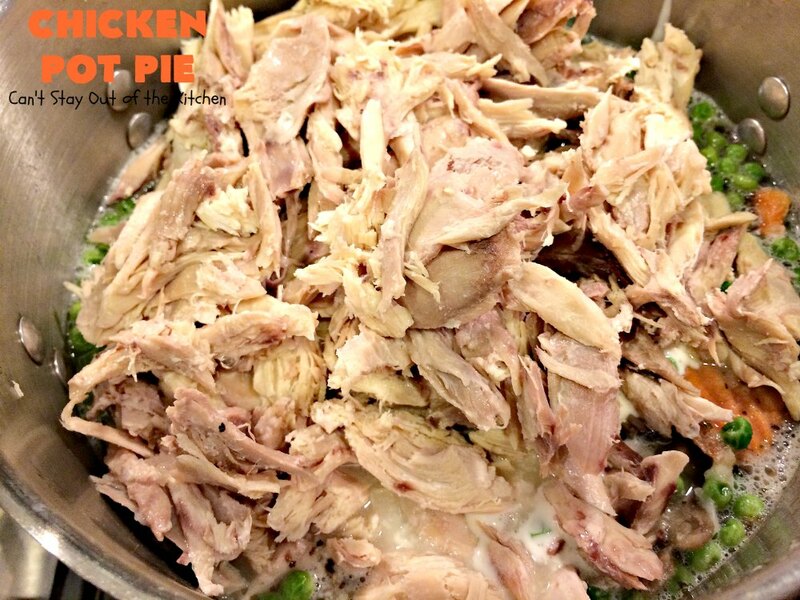 This is also a great way to use up leftover turkey from Thanksgiving or Christmas. You will need about 5 cups of cubed or diced turkey to equal about the same amount from a chicken used in this recipe. In the event that you have leftovers like corn or green beans, those can certainly be included. I hope you try this recipe sometime. It really is special even if it takes a good bit of time. You will find yourself going back for more…more…more! 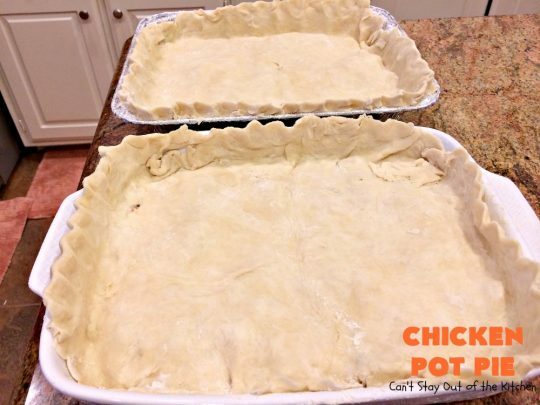 Because this recipe makes 2 huge 9×13″ baking dishes, you can easily freeze one for later or take one to a neighbor or friend who could use a hug! Chicken Pot Pie from The Dove’s Nest is a spectacular savory pie recipe. 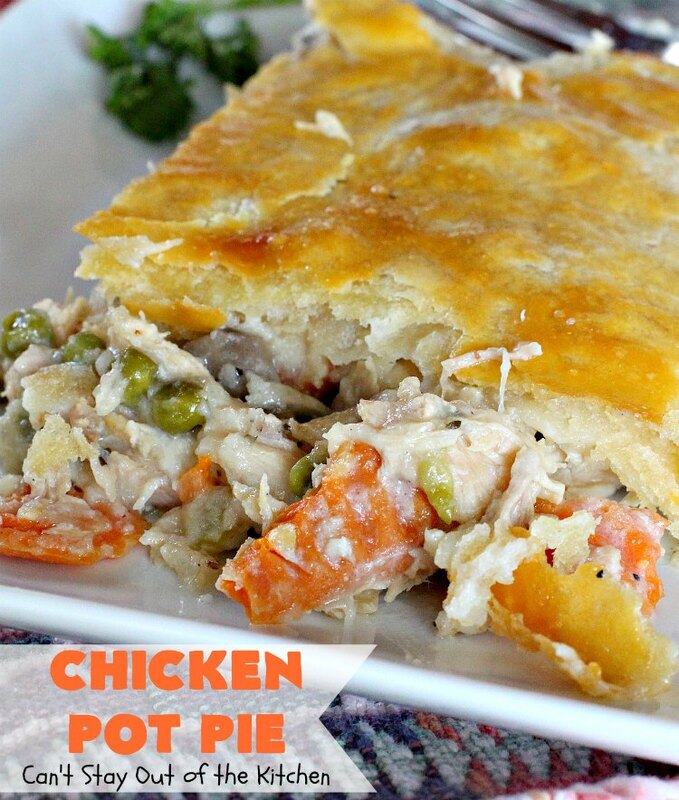 This pot pie is filled with lots of veggies in a wonderful cream sauce. I served Chicken Pot Pie with Homemade Dinner Rolls and Cheesy Spinach Bake. We savored every mouthful. This is a great one-dish meal. You really don’t need to serve anything else with it! Cook off a whole chicken and debone. Reserve all the chicken broth. Or, have on hand canned chicken broth and canned chicken. 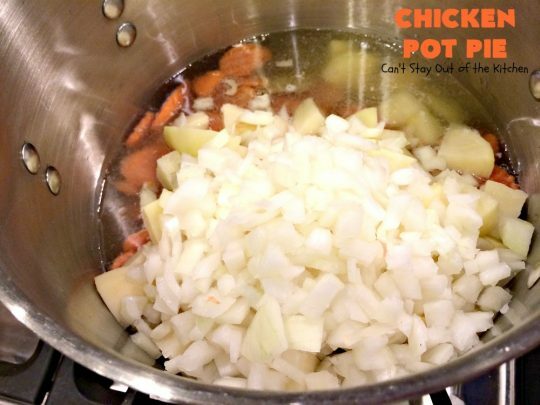 Place chicken broth and bay leaf (or leaves) in the stock and bring to a medium-high heat. 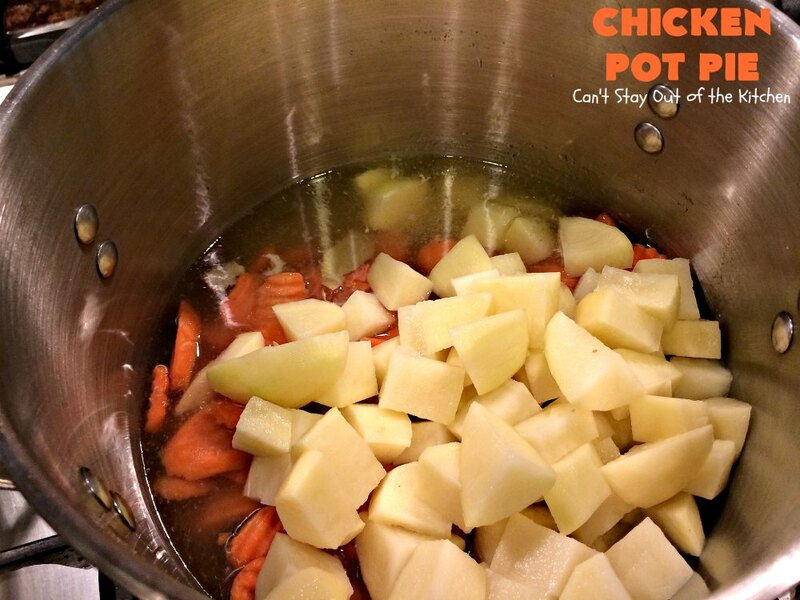 Add minced garlic, crinkle-cut carrots, and potato chunks. Add diced onions. Cook over medium heat until veggies are tender. If you are adding sherry you would do it here. Add peas, mushrooms and basil. My fresh basil went kaput so I had to use dried basil. Fresh is so much better. While veggies are simmering, in a separate sauce pan melt butter. Add flour. Add heavy whipping cream. Work in about 1/4 cup at a time with your whisk before incorporating more cream. Keep whisking and adding cream. Keep cooking over medium heat until mixture thickens. Stir salt and pepper into the sauce and continue cooking until mixture thickens. Add cream mixture into the veggie mixture and stir to incorporate. 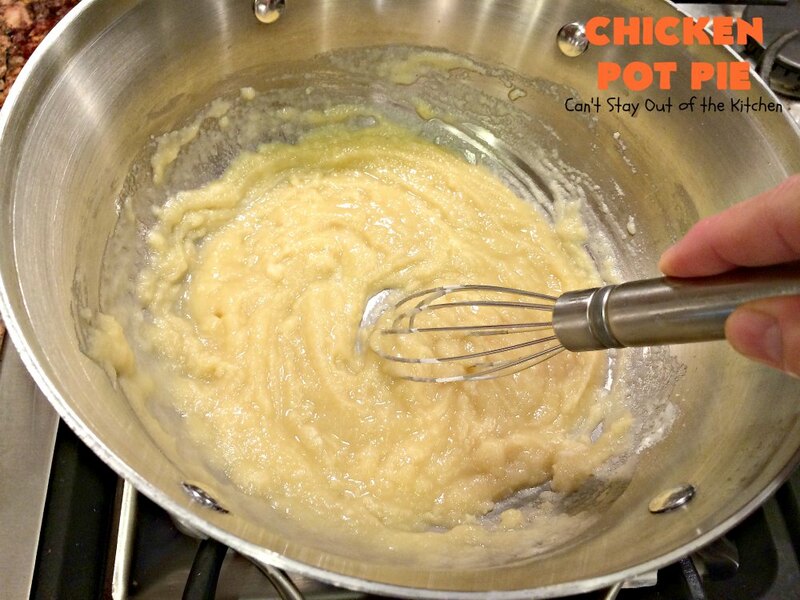 Stir to combine and cook until mixture thickens. I highly recommend you check the seasonings now to see if you want to add more. You can’t do it once you put the crust over top! 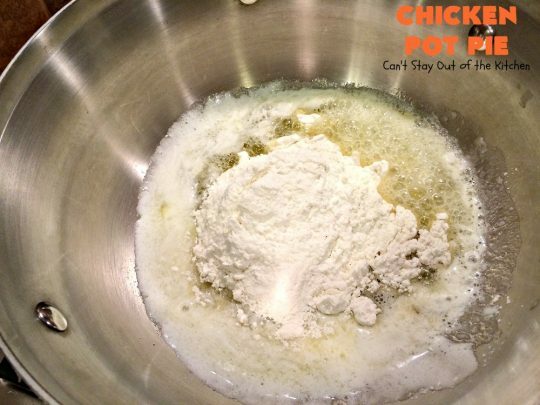 Pour contents of chicken mixture into two 9×13″ greased baking dishes. Roll out pie crust to fit the surface of the casserole dish. Fold into quarters for easier handling. Unwrap dough over top of casserole and flute edges. 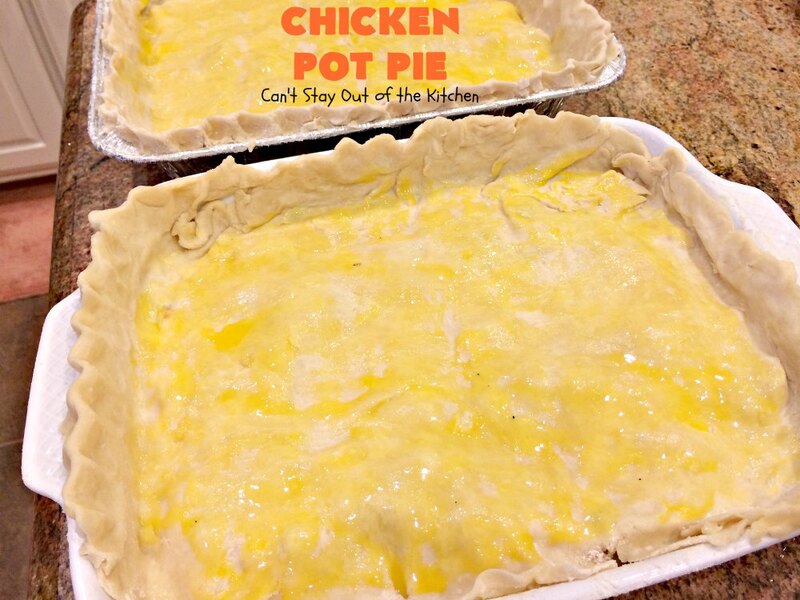 I topped each baking dish with Homemade Pie Crust You can also use your own recipe or store-bought pie crust. Separate an egg. Discard the egg white or use for another purpose. Brush the yolk on top of the crusts. I actually used two egg yolks–one for each pan. Bake at 350 about 45 minutes until lightly browned and bubbly. Remove casserole dish from oven and allow to rest for about 5 minutes before cutting and serving. 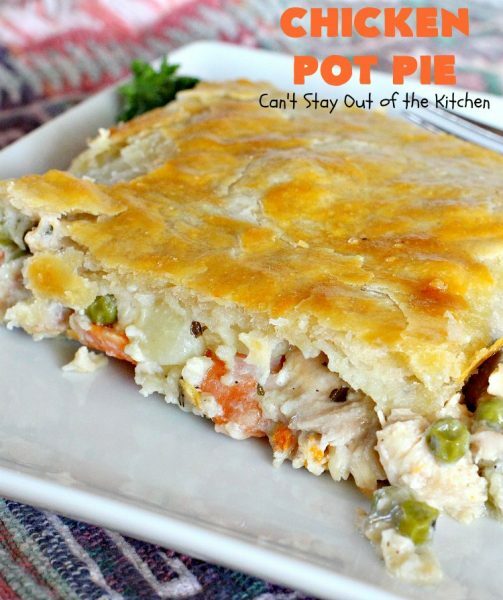 Doesn’t Chicken Pot Pie look wonderful? It tastes terrific! Chicken Pot Pie is a little more work than some family dinners but it’s really worth it. 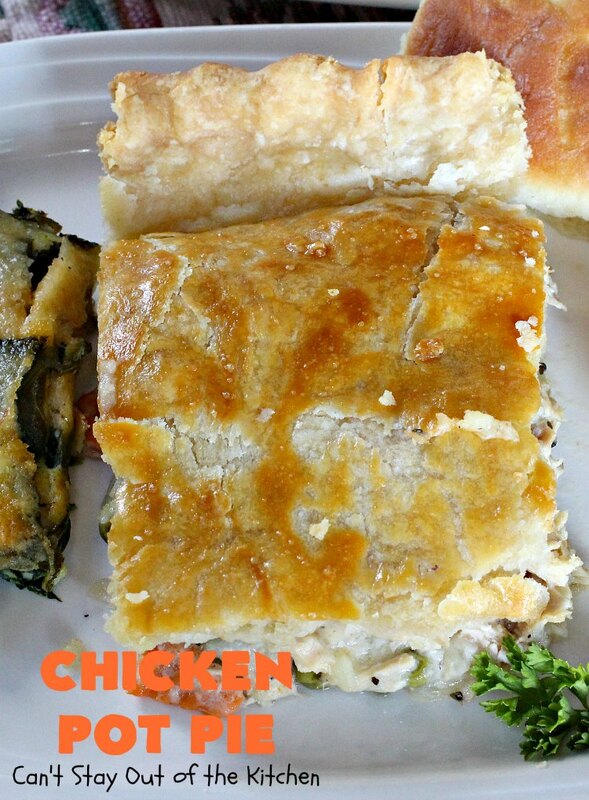 This savory dinner pie tastes spectacular! 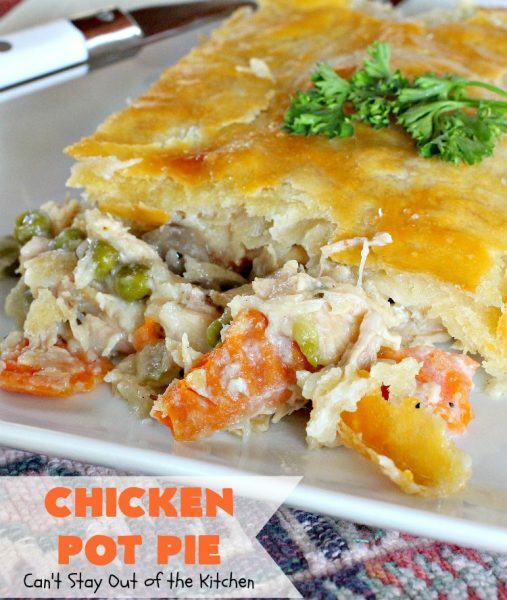 Chicken Pot Pie is a fantastic recipe your family will adore. 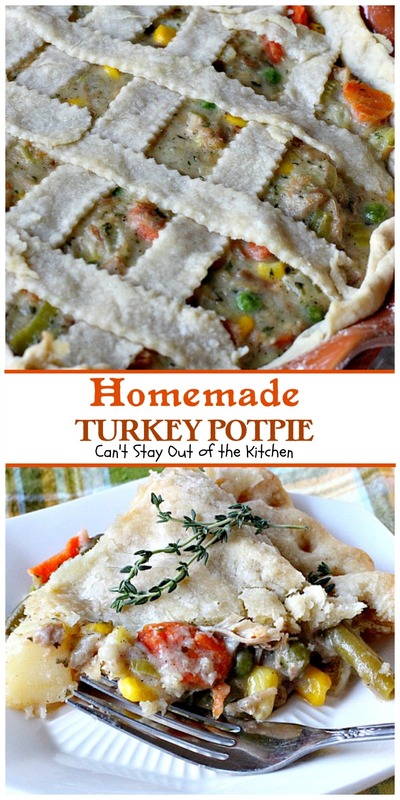 You can also use this way to use up extra Thanksgiving turkey! 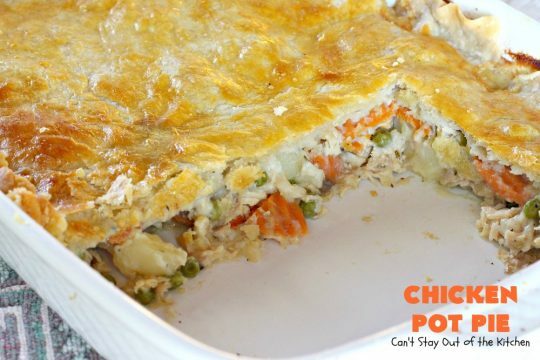 This scrumptious Chicken Pot Pie is filled with carrots, peas, onions, garlic and mushrooms. This is southern comfort food at its finest! It's also terrific for family or company dinners. Recipe adapted from The Dove's Nest tea room in Waxahachie, Texas. 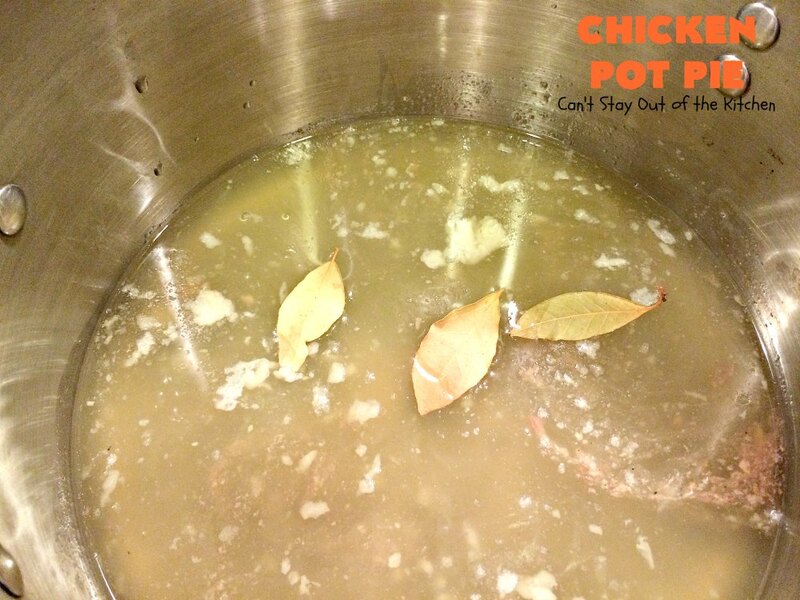 Boil the chicken in water with the bay leaf and garlic in a large stockpot until cooked through. Remove the chicken from the stockpot, reserving the stock. Let the chicken cool and then debone. Add the carrots, potatoes, onion, (sherry if you are using this) to the reserved stock. Cook over medium-high heat until the vegetables are tender. Add the basil, mushrooms and peas. Stir in the flour gradually. Pour in the cream gradually, stirring until mixed. Simmer until thickened, stirring constantly. 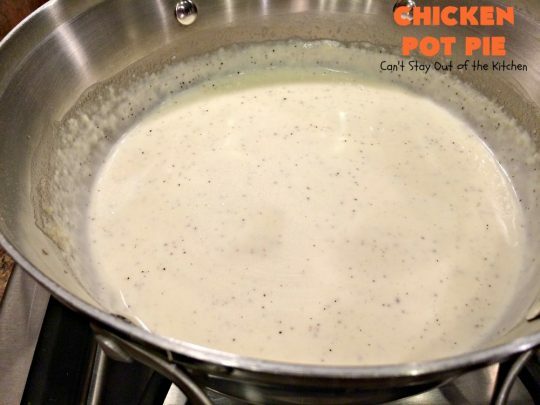 Add the cream mixture and chicken to the vegetables and broth, stirring well. 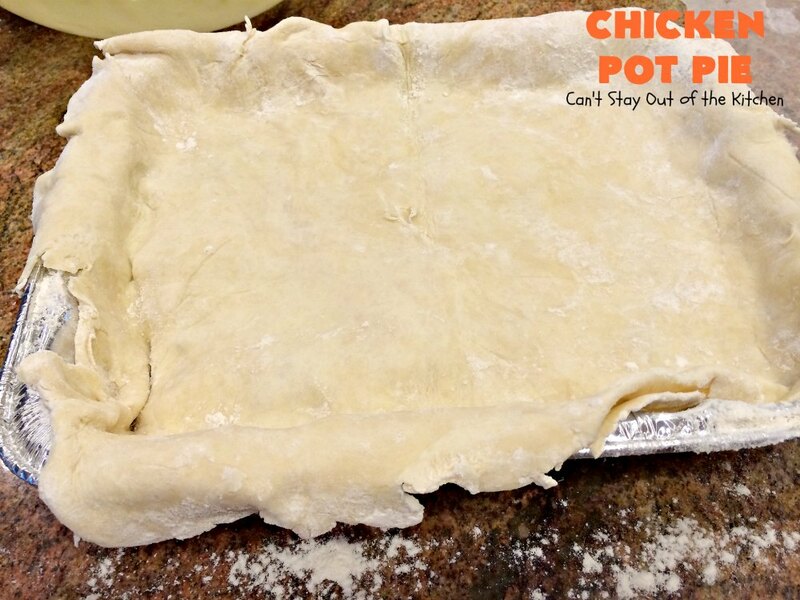 Roll out the pie pastry to a 1/8” thickness. 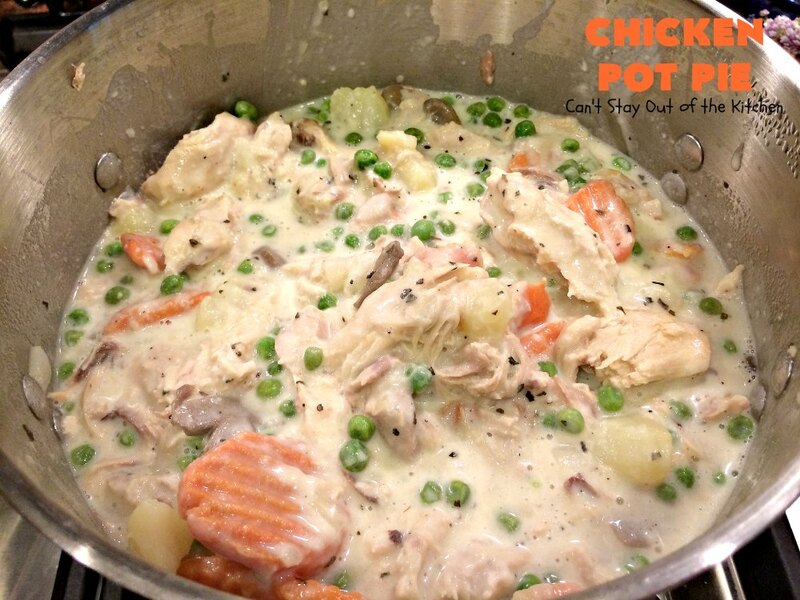 Place chicken mixture in two greased 9x13” casserole dishes. 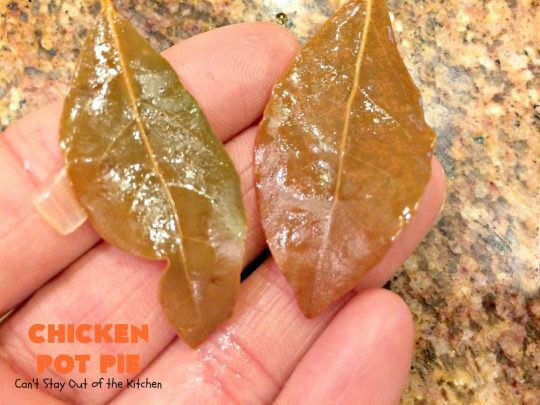 Top each with pie crust. 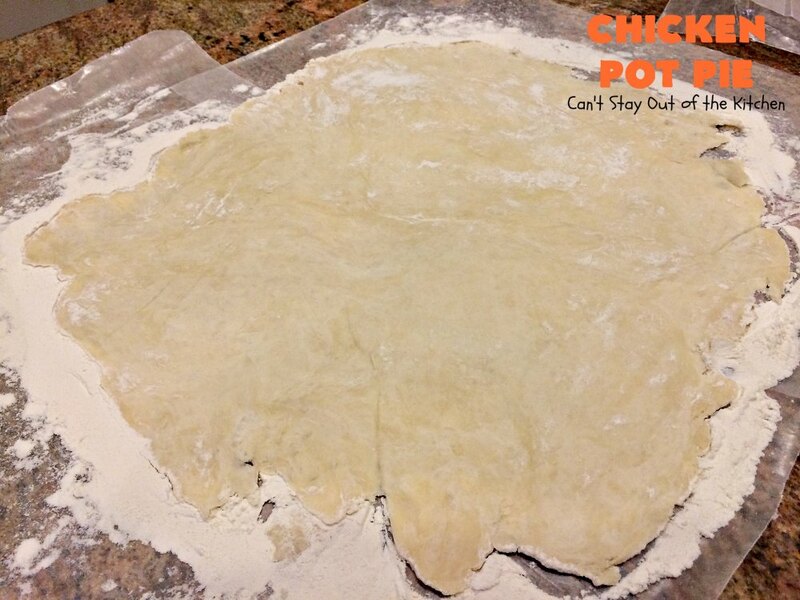 Cut a few slits in dough to vent steam. Brush top with beaten egg yolk. Bake at 350° for about 45 minutes or until browned and bubbly. Makes two 9x13" casserole dishes. Allow casseroles to rest about 5 minutes before cutting and serving. NOTE: This recipe makes two 9x13" casseroles. If you prepare one in a foil pan you can freeze it before baking it and then have it ready for another time. Each casserole serves 8 large servings. NOTE: Check seasonings before placing pot pie filling into prepared pastry. You may want to double the seasonings. 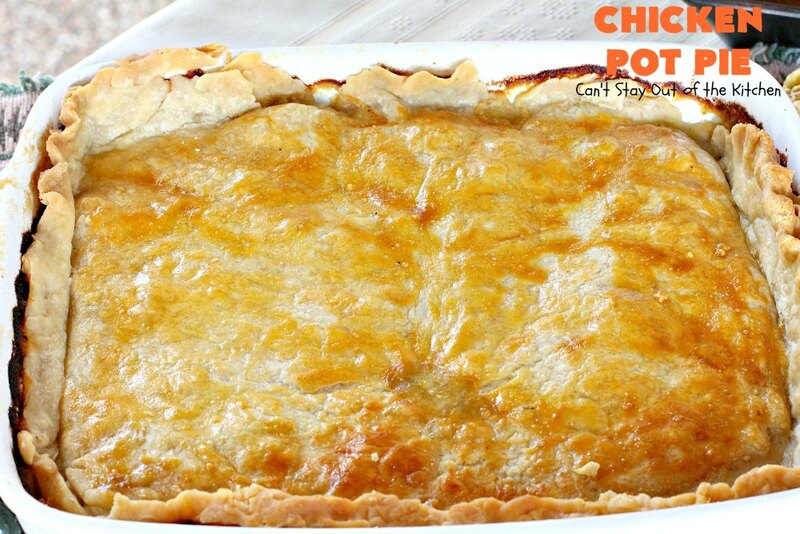 NOTE: To cut down on preparation time, you can use canned chicken and broth and pre-made pie crust. NOTE: Preparation time does not include time required to pre-cook chicken. Recipe source: adapted from The Dove's Nest Cookbook. Chicken pie filled with carrots, peas, onions, garlic, mushrooms, and made with whipping cream, basil, bay leaves, and chicken stock. [url href=”http://thedovesnestrestaurant.com/” target=”_blank” title=”the dove’s nest restaurant”]Dove’s Nest [/url]version. 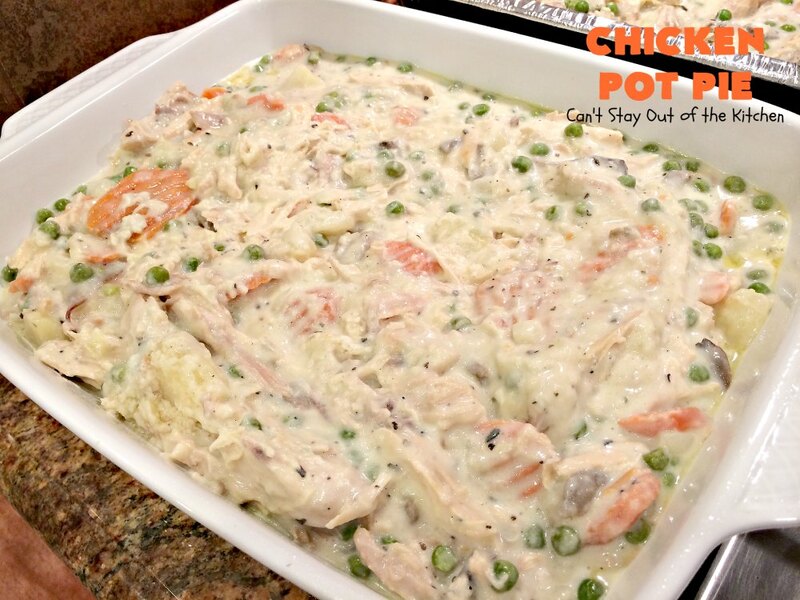 Place chicken mixture in two greased 9×13” casserole dishes. Top each with [url href=”http://cantstayoutofthekitchen.com/2012/12/05/homemade-pie-crust/” target=”_blank” title=”homemade pie crust”]pie crust[/url]. 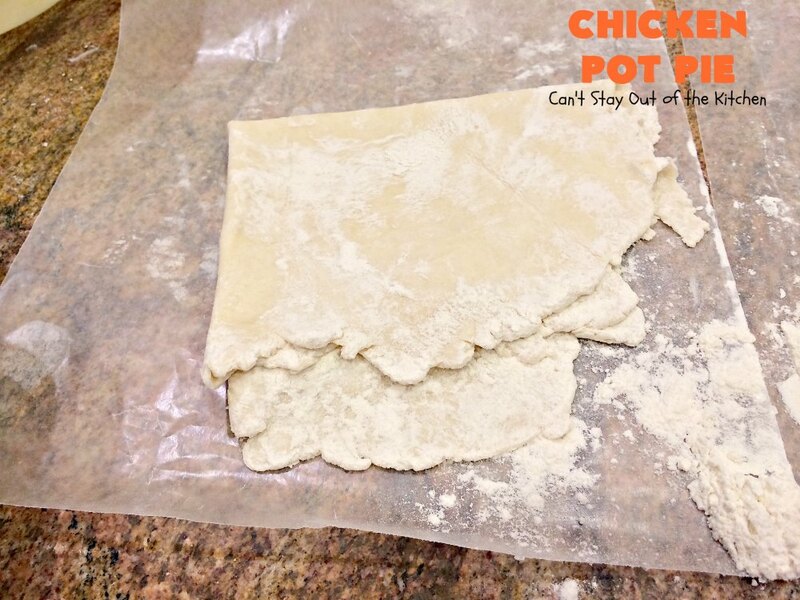 Cut a few slits in dough to vent steam. Makes two 9×13″ casserole dishes. 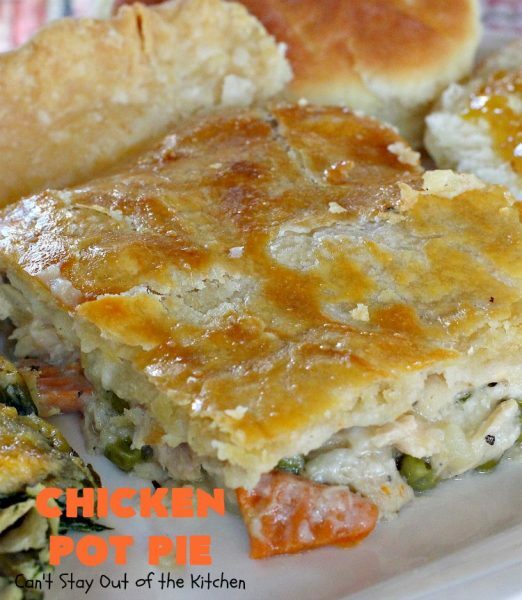 The Dove’s Nest[/url] serve this delicious chicken pot pie recipe in small flowerpots. 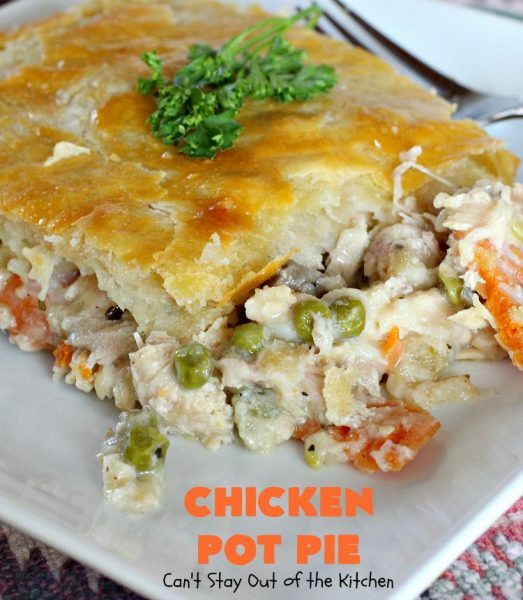 Hence, the name “Flowerpot Chicken Pie.”[br][br]This recipe makes two 9×13″ casseroles. If you prepare one in a foil pan you can freeze it before baking it and then have it ready for another time. 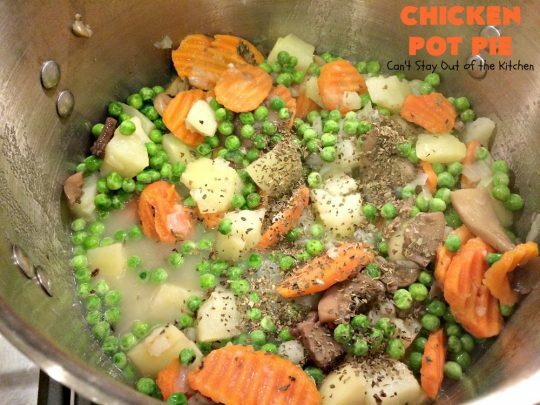 Each casserole serves 8 large servings. 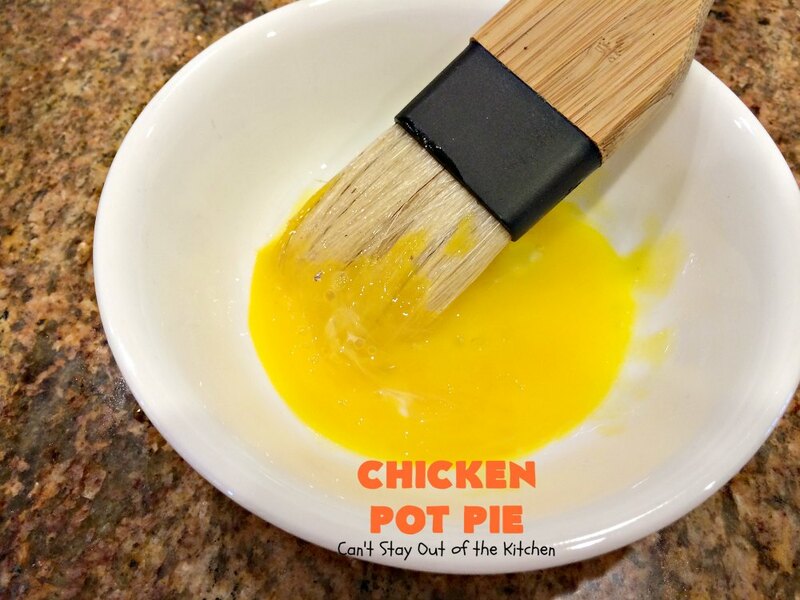 The egg yolk allows the crust to brown up a little when baking. This is a great way to use up some of your garden produce too. There’s no reason why you couldn’t add other fresh veggies like corn, beans, broccoli, or squash to this basic recipe. This is an amazing recipe for company too. Everyone loves it, and it makes so much that it’s great for potlucks or large family gatherings. 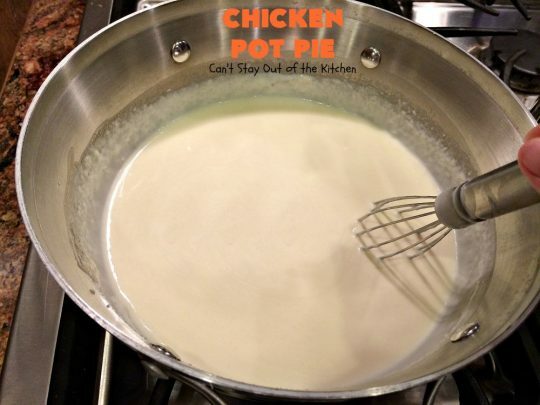 Chicken Pot Pie is a lot of work, but it’s a great recipe to make up in advance and put one of the casseroles in the freezer for later.